The 131-year-old Hahn Building at First and Pike is on the way to being demolished and replaced by a 14-story hotel. Opposition to the project began with residents of a condo building behind the proposed hotel, but now has spread to a petition signed by thousands. It’s a battle at the center of which is an ordinary-looking three-story building that began its life 131 years ago at the corner of First and Pike in downtown Seattle. 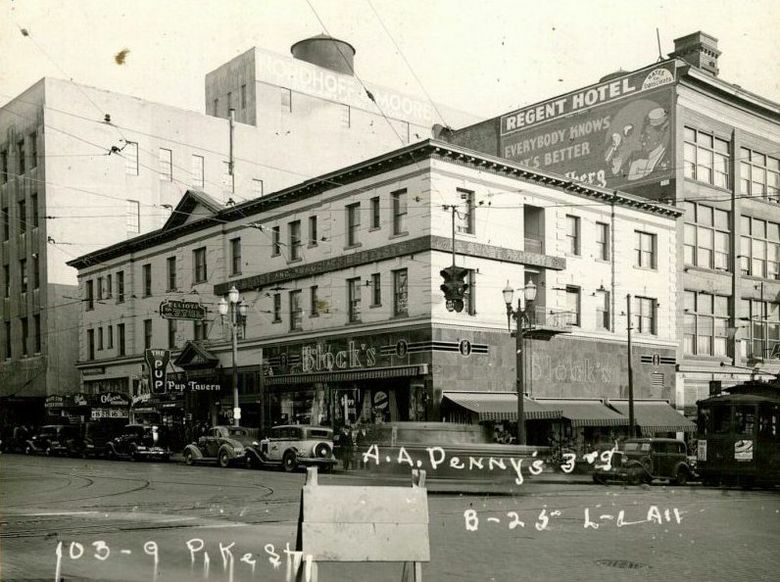 Should the Hahn Building stay or should it go, and be replaced by a 14-story hotel? Would it scar the city’s best-known intersection to have a building tower over it? The fight is over an old structure that never was the prettiest edifice in town, common bricks and concrete blocks for the first floor. It was twice rejected for historic-landmark status by the city’s preservation board, which concluded various businesses had altered it so much it “can’t convey any significance,” said a board member. This fight over the Hahn Building initially pitted a couple of developers against owners of condos at the Newmark Tower, which sits right behind the proposed hotel. Those were the initial rounds. It’s escalated considerably. At the beginning, on one side was Marketview Place Associates, the development company led by Lars Jonsson and Doug Buck. Jonsson is CEO of Stellar Holdings, a Seattle company with investments in the Pacific Northwest, Sweden and Poland. Buck is a longtime Seattle commercial real-estate entrepreneur. The two men, in turn, hired an architecture firm, Ankrom Moisan (“Our mission is simple: Create places where people and communities thrive”). Well, not so much after 145 feet go up in front of the living-room windows. In the brave new world of social media, what happened next is the kind of confrontation that certainly makes a good case study. Two of the condo owners, Dan Merkle, an attorney, and Kevin Britton-Simmons, who’s in the business of connecting mortgage borrowers with lenders, decided to make this an emotional, citywide issue. 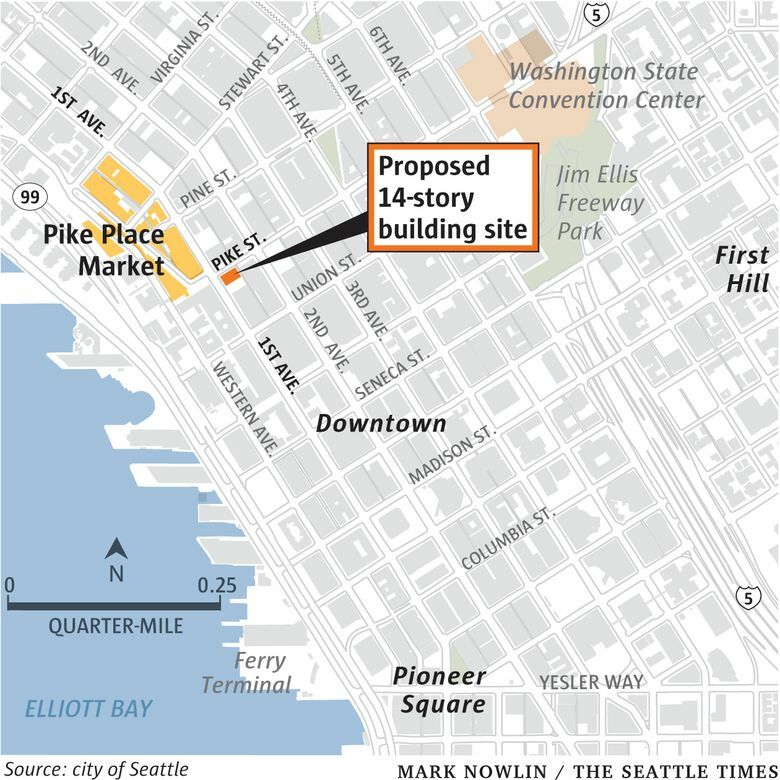 The hotel, says the petition, would “permanently alter the symmetry and scale of the 4 corners of the Pike Place Market entrance” with its much-shorter buildings. The petition is now at over 7,100 signatures and rising. “It just exploded. I can’t even explain how that’s happening. It’s the magic of social media,” says Britton-Simmons. Then came a Facebook page, and that began to be shared. He adds that many of the Newmark Tower residents don’t have condos facing the Market. “We have 40-story towers going up all around us and we’re not complaining,” he says. 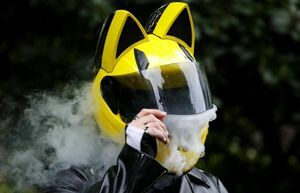 They had tapped into the strong emotions that the Market brings out in Seattleites. Then preservationists stepped up after finding out about the petition. Among them was Eugenia Woo, director of preservation services with Historic Seattle. Although the bulk of the comments sent to the board oppose the hotel, there are two notable emails from businesses supporting it — from the owner of The Pike Brewing Co. and the owner of the Wild Ginger and Triple Door. 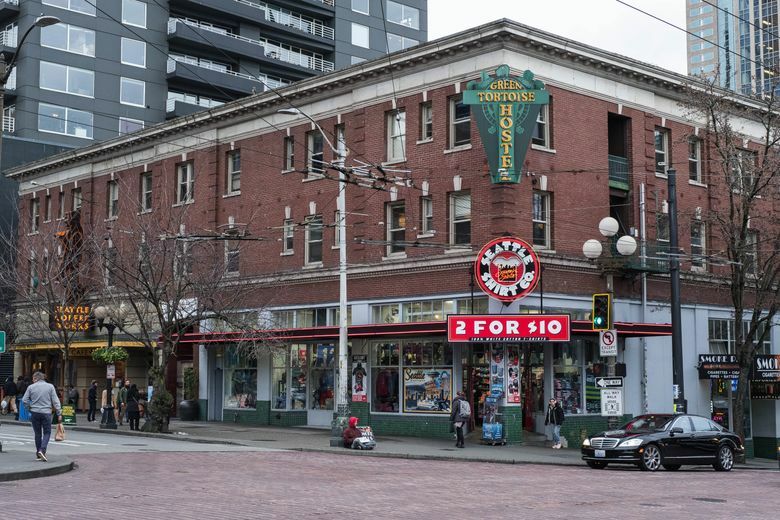 Current tenants at the Hahn Building include the Seattle Shirt Co. (“2 for $10”) and the Green Tortoise Hostel in the upstairs. 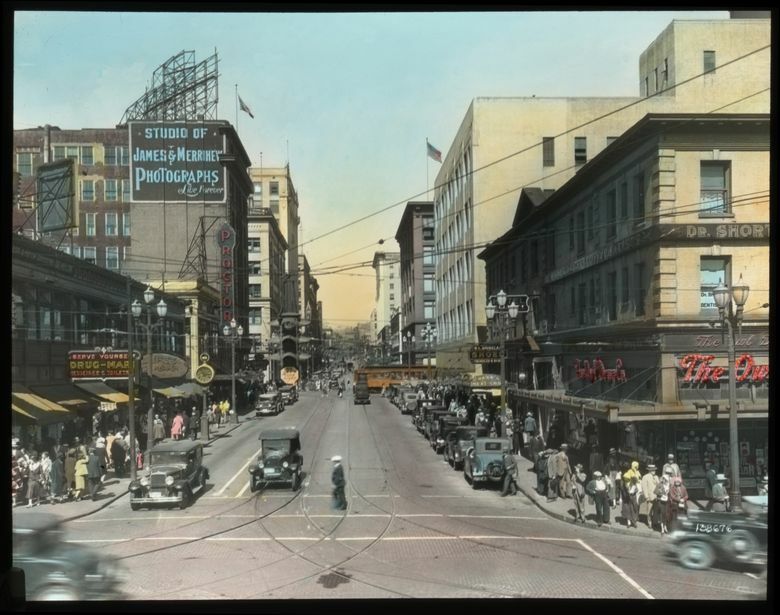 Over the years, it has housed businesses that included a saloon, barbershop, drugstore, shoe store and cafe. This was not a place for the moneyed class. In the 1970s and the 1980s it was the corner location of the infamous International Donut Shop run by Guenter Mannhalt, convicted in 1990 of heading a criminal enterprise. On Tuesday evening, some 100 people crowded, and spilled out into the hallway, at a hearing room in City Hall. Inside, the Downtown Review Board had a second deliberation and heard from the architectural firm about changes to the hotel’s design. Not discussed was the essential issue that had brought most of those 100 people to the meeting: the 145-foot height of the hotel. A number had come well-prepared with their arguments. They had not been intimidated by the “early guidance” 79-page PDF document from Ankrom Moisan that was presented to the board. Among them was Gordon Griggs, a retired administrative judge. He and his wife own a condo at the Newmark. He, too, can talk the talk when it comes to early guidance. 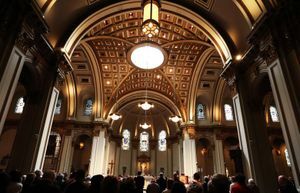 “It is my understanding that SDCI (Seattle Department of Construction & Inspections) refuses to address concerns of building height, on the theory that height restrictions are controlled by zoning codes alone,” he said. At Tuesday’s meeting, a young woman who said she was a barista at Pike Place Market stood up to speak. In a nervous voice breaking with emotion she talked about the importance of the Green Tortoise Hostel at the Hahn Building, where a bed in a dorm room goes for around $38 a night. But that was not discussed by the board. “I think they were hoping we would be activists on their behalf,” says Anjali Grant, who was chairing the meeting. The board sent the PDF back to the architects, with more suggestions about this and that, but not about the height. The project, though, is moving inexorably forward. Mark Hinshaw is a respected architect, urban planner and architecture critic. He’s moved from Seattle to central Italy, where he’s quite happy. He was forwarded material about the Hahn Building. He doesn’t give the opponents much hope. Of course, the opponents can always remember how Seattle architect Victor Steinbrueck and a group of friends banded together in the late 1960s when the Pike Place Market was going to be torn down and replaced with high-rise condos, hotels and other modern stuff. The mayor and City Council thought demolishment was just a great idea. At one point, Steinbrueck’s group protested in front of City Hall by handing out daffodils. Friends of the Market went to the voters and they listened. In November 1971 they voted to preserve it. That’s the thing about issues that bring out the emotions. It looks like a done deal, and then it isn’t. Correction: An earlier version of this story misspelled Eugenia Woo’s name.